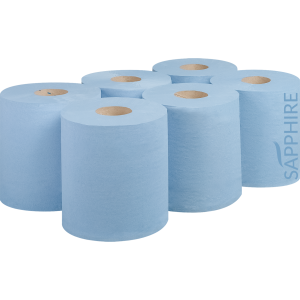 Sapphire Blue Flat Sheet Centrefeed Rolls are manufactured exclusively from Fourstones Paper Mills high quality recycled tissue paper. 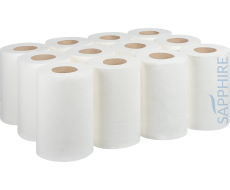 Our range of flat centrefeed come plain with no emboss and are available in a large selection of plys, widths and lengths, providing you and your customers more choice. 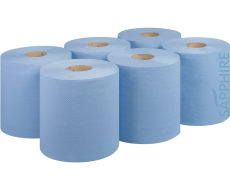 All of our centrefeed are packaged in a clear protective polythene, with easy tear perforations and marked removable cores. Following CHSA guidelines, we guarantee high quality and accurate measurements. 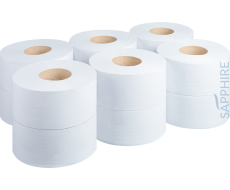 – UK manufacturer – Food safe – Easy to tear – Absorbent and strong – Shrink-wrapped to ensure rolls are protected – CHSA accredited.